-- or to give it its full official title of "The Royal Albert Hospital and Eye Infirmary and Children's Ward for Devonport, Stonehouse, Cornwall and West Devon, instituted March 1861". The Royal Albert Hospital 'recently taken'. From a postcard by Waterfield, Devonport, dated 1905. 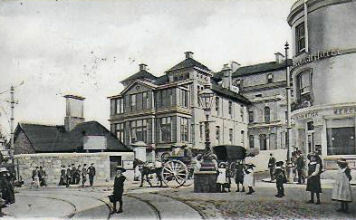 It originated as the Dock and Stonehouse Public Dispensary, established in 1815 and situated for nearly 50 years in Chapel Street, Devonport, in buildings used as the Parochial Office. The Admiralty intended to erect a hospital for the service population in Devonport and as the South Devon & East Cornwall Hospital in Plymouth declined to be connected with the project, Mr Thomas Woollcombe took the matter further. Work started on Monday March 3rd 1862, the tender of Mr Jenkin of Devonport, value £6,900, having been accepted on Thursday February 27th. with Marlborough Street on the right and New Passage Hill to the left. The Royal Albert Hospital was designed by the Devonport architect, Mr Alfred Norman and built by Messrs Jenkin and Hallett. Miss Florence Nightingale arranged the wards which also met with the approval of Sir John Liddell, Director-General of the Medical Department of the Royal Navy, Doctor Sutherland and Captain Galton, Royal Engineers, Commissioners for enquiring into Military Hospitals. The building, which was in the Italian style, was 200 feet in length and built entirely of dressed stone. 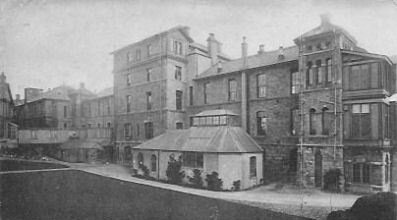 It would eventually contain an accident ward, with eight beds, two general wards with sixteen beds each, a ward with six beds for eye cases, a ward with thirteen beds for persons able to contribute partially towards the cost of treatment. In addition to these requirements of a normal hospital, it would also contain a Female Lock Ward of at least twenty-five beds, this being at the express request of the Government under the Contagious Diseases Act, who would be paying £3,500 towards the cost of the hospital and £750 per annum towards the maintenance of the Lock Ward, which formed the eastern wing of the hospital. The western wing, which had distinct entrances and was internally quite separate from the Government wing, formed the civil general hospital. The Memorial Stone was laid with full Masonic honours on Tuesday June 17th 1862 by the Right Honourable the Earl of Mount Edgcumbe. It was opened during a fête and bazaar on Tuesday December 1st 1863 with 10 beds but by June 1864 it boasted 25. Later it was enlarged to 120 beds. It was named after the Queen Victoria's Prince Consort following his death on Saturday December 14th 1861. The cost was £30,000 inclusive of fittings. For Christmas in 1884 the Hospital received donations of fifty pheasants from Mr E C Baring of Membland Hall, a large parcel of toys from the residents of Stoke Fleming in south Devon, and toys plus 4s 6d from the children of a Mrs Howard. Captain Morshead, Royal Navy, of Widey Court, sent a donation of £5. HRH the Princess Beatrice laid the foundation stone of a nursing home in June 1900. This 'valuable addition' to the Hospital was reported in May 1901 to be almost finished. In 1912 the hospital accommodated 50 patients in the general wards, eleven in the special and emergency wards and two in what were called the home wards. About 3,500 out-patients were treated every year. During the Great War the Admiralty took over part of the hospital for its own use and retained it after the War as a War College and Port Library. Electric lighting was installed in 1918 with funds provided by the nursing staff. Royal Assent was given on July 12th 1934 to the Prince of Wales' Hospital Plymouth Act. It transferred to the Ministry of Health upon nationalisation in 1948 and became the Devonport Section of the Plymouth General Hospital in 1963. The Royal Albert Hospital was closed on Tuesday June 9th 1981 when Derriford Hospital opened.